It was in the early spring of 1978 when I first laid eyes on the Green Rover. I had been out for a drive in my 1969 Land Rover 88. I was feeling a little nostalgic and had decided to drive by a house I used to live in. Sitting beside the house under a canopy of redwood trees was a green 109 pickup. Noticing that her tyres were sunk an inch or so into the soil and that she had a deep coat of redwood needles, I quickly deduced that here sat an unloved and most likely a non running Land Rover. Just the month before, I had finally made the decision that my 88 needed to be replaced by a car that could hold more than two bales of hay and two adult dairy goats. Sitting forlornly in front of me was the logical solution to my problem. I got out of my 88 and knocked on the door. No one was home. I took a quick look at the 109. She was an older model than my 1969. Long ago, someone had sprayed her original limestone white paint with a gray primer and Hunter green paint from a spray can. The paint was applied to the entire body, including the zinc work and was oxidized and peeling. The pickup top was pushed in from a weight on top. The upholstery had a number of tears but seemed complete. The car was shod with a set of Michelin XCL's, with the tread almost gone. The front had a huge electric winch sitting behind a homemade brush bar. There were holders for a pair of European sized jerry cans in the front and a pair in the rear. The front left wing showed deep bondo cracks. The frame seemed solid, but the exhaust system resembled Swiss cheese. The rear had the tail light lenses moved up and inward to allow space for a pair of jerry cans in the rear. The rear jerry can mounts were on the frame where the lift bars were originally located. The license plate lamp was inverted to shine on a license plate mounted on a camper that was no longer bolted to the car. All that remained were large mounting holes in the bed of the car, a pair of rusting steel water tanks sitting in the cut away rear tool boxes, and a 5 gallon propane tank mounted below the side bench between the right rear tyre and the the front right fuel tank. It looked like this 109 had been outfitted as a long range expedition car in her younger days. I imagined what she looked like back then, A white pickup sitting atop four Michelin XCL tyres, a black rectangular brush bar, bonnet mounted spare and a big winch up front. A camper of some kind bolted to the bed behind the cab and a jerry can at each corner. 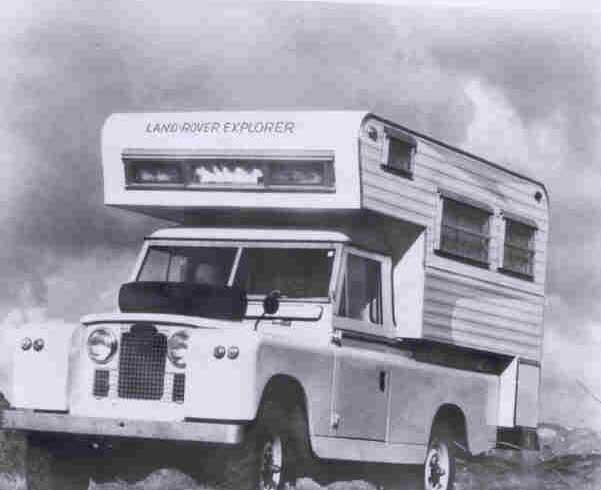 In her youth, The Green Rover might have looked much like this white Land Rover Explorer, only with a big winch on the front, a brush bar, jerry cans mounted on their backs on the front bumper, a shorter camper that did not overhang the rear body and a pair of jerry cans on the rear. With two front under seat tanks and four jerry cans, she had a long range. There was a decal in her front window, a stylised green 88 Land Rover with words in Spanish. I wondered where this car had gone and how she ended up here in such a sad neglected state. Since the peeling green paint coated the water tanks and inside of the bed, I deduced that the rattle can gray primer and hunter green paint was applied after the camper was removed. It was love at first sight. I returned a couple of days later and met the owner of the Green Rover. From him, I learned her history. 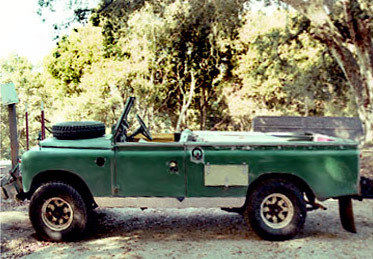 She is a 1960 Land Rover, originally sold into Eastern Canada. At some time in her past, she moved down to New Hampshire. The person who owned the car at that time had died and the current owner inherited her around 1974. He brought her to California. He was not mechanical and thought that you only needed to put oil in the engine. He drove her until the rear differential ran dry, put her into four wheel drive and drove her for another half year until the transfer case went dry. She had been sitting beside the house for almost 2 years after being towed home. I purchased The Green Rover for US $ 350 and towed her home. Unfortunately I only took pictures using a single roll of film and that roll was lost undeveloped for several ears before being found and processed. So all my early pictures are blurry. An inspection showed that everything on the car was worn out and loose. An old expedition Land Rover had fallen to a sad state that very few cars recover from. After replacing the battery and cables, I turned the engine over on the starter motor. Everything seemed OK. Encouraged, I changed the oil, cleaned out the sediment bowl in the fuel pump and the float bowl in the Solex then added fresh petrol. The engine fired right up. It was like she was telling me that she wasn't dead, just neglected and in need of some loving help. Early on she received her name, The Green Rover. My red 88 was named after a children's game I used to play... Red Rover, Red Rover send TeriAnn right over... So the Green one became "The Green Rover" to tell her apart from the Red Rover. Not an inspired way to name a car. But somehow it stuck even after I sold the 88. It took a few months for me to rebuild the transfer case, replace the differential, the loose 'U' joints and the exhaust system. By fall of 1978 the Green Rover was mobile and registered for the road. Since The Red Rover was my first land Rover I got my sense of interior esthetics from the '69. One of the first things I did to make the Green Rover mine was paint the instrument panels black like the Red Rover's and traded running lamps. I also switched Kodiak heaters between the two as I liked the Red Rover's heater ducting better. Replacing the badly worn steering box with a good condition late IIA steering box I was offered for free made the interior more familiar. Soon after the Green Rover was on the road, the Red Rover with a few transplanted series II parts was sold. As I repaired or replaced parts I discovered a mixture of original parts and newer parts. My guess is that the prvious owner purchased parts from his local Land Rover dealer and upgraded parts and assemblies with what was currently available from the dealer. As I replaced broken, missing and worn out parts I continued that tradition, replacing parts with whatever I could find regardless of whethere or not the part was "correct" for a 1960 Land Rover. Around 1980 I traded the pickup top for a 109 tropical top so things would stay dryer in the winter. I was very fortunate early on in that I discovered an expert Land Rover mechanic who patiently took on the role of mentor, answered all my dumb beginner questions and was willing to patiently show me, step by step, how to work on my Land Rover. Over 80% of everything I know about working on Land Rovers was patiently taught to me by Jim "Scotty" Howett over several years. For the next fourteen years, the Green Rover led the life of a farm vehicle. Once a week she would go to the feed store and be loaded with seven bales of hay and several grain sacks. She carried Dairy goats to the county fair, was loaded to the roof line in manure once every few months and provided general support. Her winch was used mainly to string fencing and to pull my tractor out of trouble. Coming home from the Santa Cruz county fair, 1985. Here she still had the metal boxes on each side of the frame rail that carried jerry cans. The lower rear lamp was moved to clear the jerry can. When I purchased The Green Rover the license pate lamp was loccated on the galvanized body capping facing upwards. Evidently to illuminate a plate mounted on the rear of a long gone camper. During those years I had been slowly replacing worn parts as they broke and tightening loose parts. Whenever she needed work, I tried to do something additional to help improve her overall condition. Somewhere along the line, she stopped sounding like a metal bucket partially full of loose bolts every time she went over a bump. Her pickup top was replaced by a tropical top so I could haul feed and livestock in the rain. Still this ex-expedition vehicle looked like a tired, worn out car with her peeling paint and duct-taped seat covers. Since dairy animals need to be milked twice a day, every day, trips were few, far between and short. In 1992, I made the decision to change my lifestyle by selling off the livestock. With the animals gone, I was able to start taking camping trips more often and started work to make the Green Rover more reliable for long distance driving. The Green Rover, summer 1992. I had just cut the hole and mounted a rear toolbox lid for an access door for the propane tank. Thus begins the conversion to long range expedition Land Rover. I started systematically replacing worn out assemblies. By mid 1995, she had had her engine and transmission rebuilt, both front fuel tanks replaced, an new dual power brake system installed, a new radiator installed and much more. 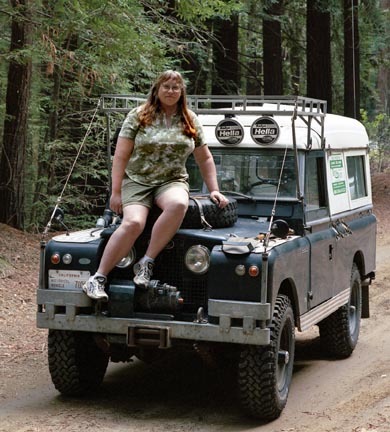 She had gone from being a tired farm Land Rover to a solid long distance driver. Her trips were mostly weekend in length and she was seldom out for longer than a week. By the mid 1990's I was camping a lot. This is the morning after a rain showing the right side where I sat up my kitchen. A 2 burner camp stove ws placed on a table next to the side access door for the built in propane tank. I slept inside on the floor and cooked outside. Setting up camp in the rain was a pain. Feeling the draw of the wild, I made the decision for go the full circle and return the Green Rover back into being a long range expedition vehicle. I decided that I wanted to take a different approach than her original owner did. I wanted the modifications to be integral to the car, keep the centre of gravity as low as possible and not to add protrusions that can be ripped off by branches if I could help it. First I spent some time deciding what I wanted the car to be optimised for and created a design specification for the "New expedition Green Rover". Once I created the specification, I spent time looking at many modified Land Rovers, camper conversions, caravans and RVs. I took my design specifications from the best modifications and expedition related features that I found, added my own thoughts and modified the Green Rover into a heavy duty long range expedition vehicle. I spent most of my free time for a year making the modifications. In September of 1995 I purchased a damaged Dormobile kit that was salvaged from a wrecked Dormobile and brought it home. The kit I had purchased needed a lot of work. The fiber glass roof had two major tares, the metal roof was caved in under one of the tares making the entire side of the root a shallow V shape. He bows that hold the pop up canvas out had rusted to powder along the long side while the top was stored outside. The furniture was rusty and in need of a complete refinishing. Restoration od the kit took a lot of time, expense and effort. I also fabricated another wardrobe and a sing stand for a second sink. In mid-August, 1997, with the body work completed, the interior mostly installed The Green Rover received a coat of 1973 Jaguar British Racing Green . A week later, I loaded my Irish wolf hound, Lacy, into the back and we started a ten week long trip through the Western United States and Canada by driving to the Portland All British Field Meet. Amazing the difference a fresh paint job makes! 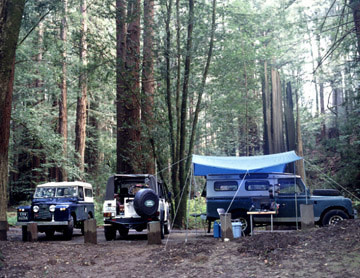 I had an absolutely wonderful time living in the Land Rover and following my whims. I knew I had done the right things and most of my designs worked better than I had hoped. When I got back and described my expedition to friends they called it the trip of a lifetime. As much as I enjoyed it, I sure hope that the trip was not MY trip of a lifetime. I want to look forward and not backwards. I followed this trip up by participating in the Land Rover 50th anniversary Border to Border Trans-American trek in April '98 that went from Canada to Mexico. 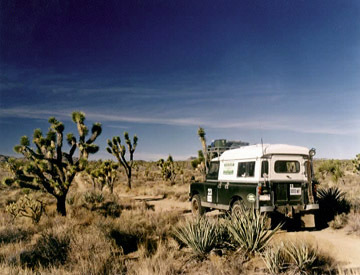 Then in June '98, I lead a 10 Land Rover photo expedition into the Eastern Arizona and Utah red rock country. 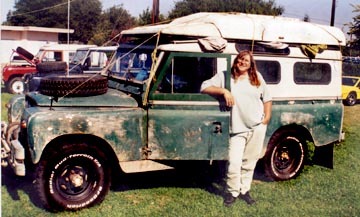 July '98 saw me driving the Green Rover to upstate New York to participate in the ANARC Land Rover 50th anniversary meet. Then in September '98, I closed the circle and journeyed North to attend the Portland All British field meet where my 10 week sabbatical started a year earlier. During the year between the '97 and '98 Portland meets I lived in the Green Rover on the trail for a total of 20 weeks. By a coincidence the 20th anniversary of my purchase of the Green Rover, and the 50th anniversary of Land Rover all happened within this period. I dream of someday loading the Green Rover onto a ship and returning her to the place of her birth for a visit, then perhaps drive through Europe and then who knows where. In 1999, The Green Rover's 2-1/4L four cylinder engine and gearbox were replaced with a Ford 302 V8 and a Borg Warner T-18 gearbox. At the same time the steering was uprated to power steering. My Rover now has much better performance both on and off the road. The Green Rover and I are always looking forwards to the trip of a lifetime. Not backwards.